The world-renowned Aggressor fleet is represented in some of the world's best dive destinations and Cocos is no exception, with the 36m long Okeanos Aggressor II running 10 night trips around this Pacific gem. 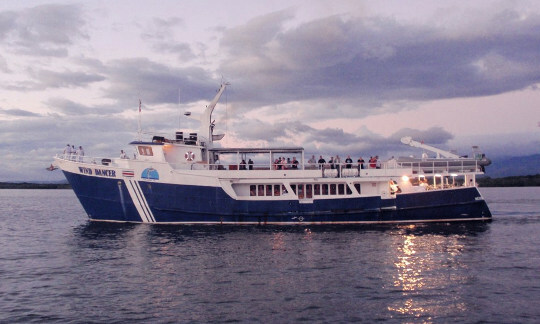 Restored in 2010, this steel mono-hulled motor yacht accommodates up to 22 divers in 11 cabins all of which are air-conditioned and feature private en-suite bathrooms. 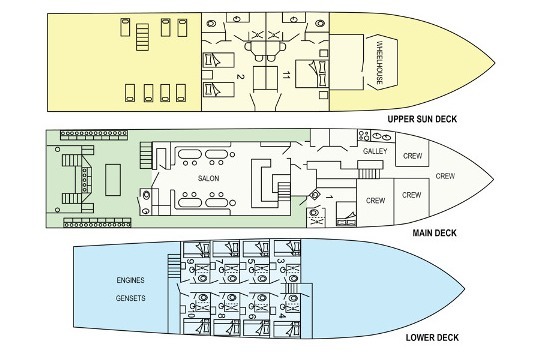 The upper deck suites are quite spacious, with large seaview windows and individual-controlled air-conditioning. Guests normally dive 3 or 4 times a day and nitrox is available. All divers are issued with personal satellite tracking devices to help minimize the risk of lost personnel at this remote spot. 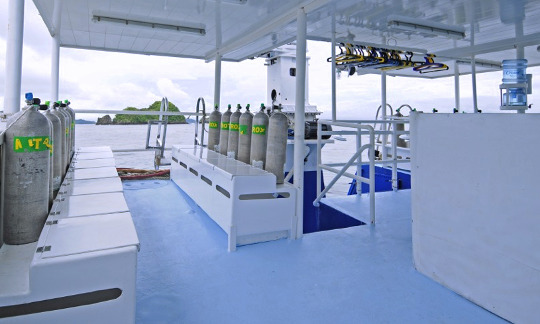 Photographers will appreciate the charging stations, camera table and camera rinse tank on the dive deck. The saloon also features computers which can be used to review your latest images. 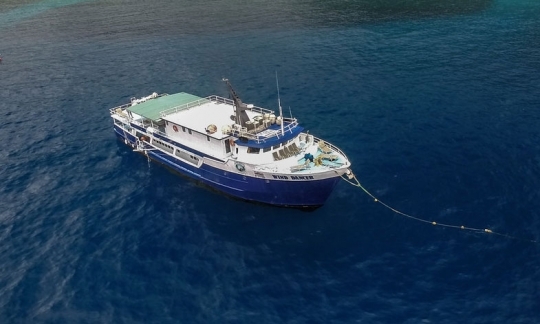 Memories of diving on this Cocos liveaboard, whether recorded or not, will stay with you forever since it is a truly unique destination. 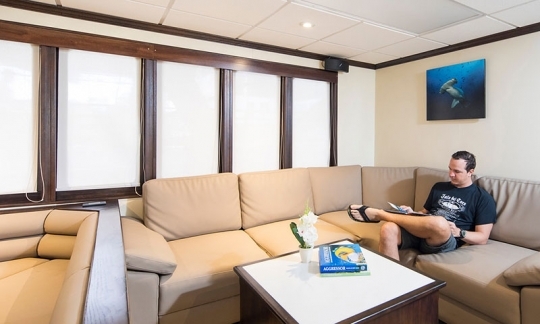 To help pass the time during the crossings, you can enjoy the entertainment facilities in the air-conditioned saloon including a TV with DVDs, games and a library including general reading as well as marine-related books. You will also enjoy chef-prepared meals on Okeanos Aggressor II, with your days dining starting with breakfast cooked to order. 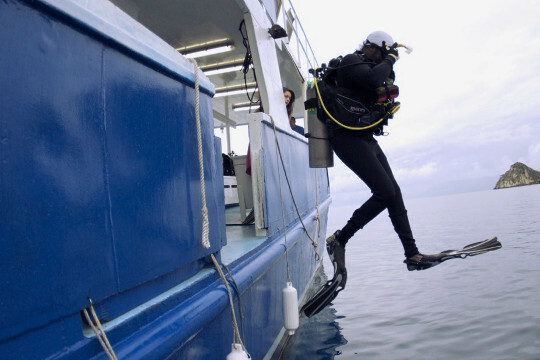 All drinks are complimentary on this diving cruise. 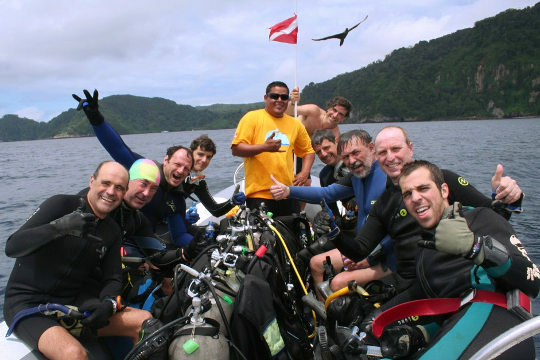 Cocos Island may be a challenge to get to but you will not want for comfort when there are little touches like bathrobes, toiletries and hair-dryers, allowing you to complement awesome scuba experiences with a little bit of pampering. 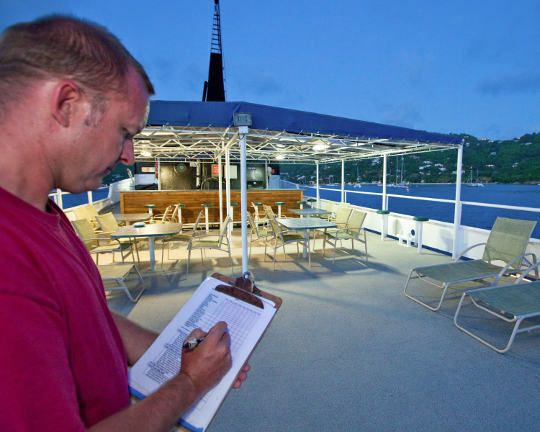 Notes: Cocos is a popular destination with limited liveaboard spaces. We recommend you book well in advance to avoid disappointment. Cruise price per person includes: Cabin accommodation with air-conditioning, breakfast, lunch, dinner, snacks, drinking water, soft drinks, hot drinks, local wine and beer, land excursions, transfers to the boat from some hotels, dives (as detailed in the trips above), experienced English-speaking divemaster(s), tanks, weights and weightbelt. Cruise price per person excludes (mandatory, unless customer provides own): Scuba equipment (US$ 260), dive computer, scuba insurance, Cocos Island National Park fee (US$ 490), departure tax (US$ 29), US$ 30 charge for an Emergency Evacuation Plan. Unless otherwise stated, all the listed items need to be paid on arrival (cash only). Optional extras: Nitrox fills for enriched air certified divers (if available) (US$ 150), torches. Unless otherwise stated, all the listed items need to be paid on arrival. 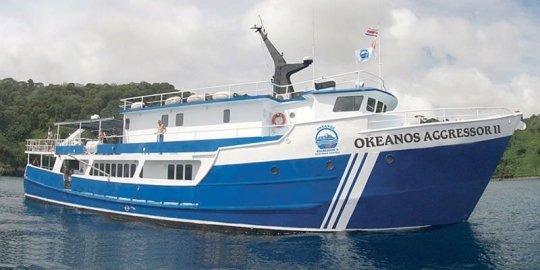 How to get there: Okeanos Aggressor II departs on both Cocos and Cano Island trips from Puntarenas. Guests fly into San Jose and are transferred from either the Holiday Inn-Escazuor or the Holiday Inn Express Forum by the operator to Puntarenas. 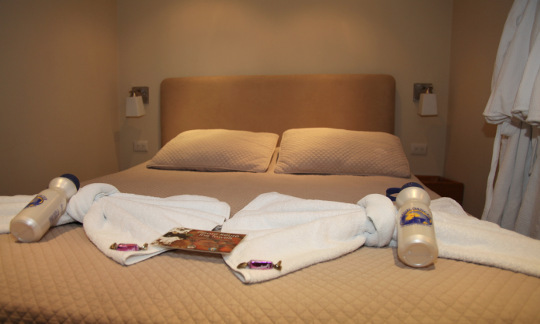 Guests will require one hotel night in San Jose, Costa Rica prior to boarding. For more information see our Costa Rica travel information section. Note: Departure times vary according to the tides. You will be informed in advance of your pick-up time and the charter departure time. The last dive of the trip will be at around 12:00 noon on the second last day of the trip. Please wait at least 18 hours before flying after diving. 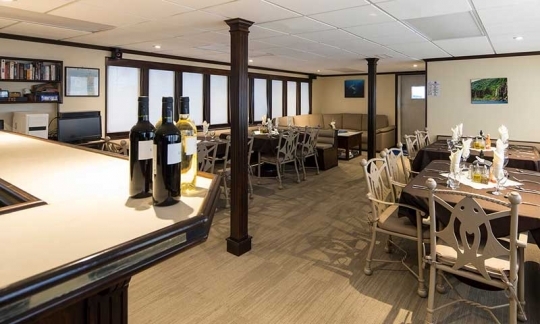 Dive clubs and group discounts: Pay for 9 guests and 2 extra guests can join the cruise in a Deluxe cabin free of charge (total 11 guests or more ). 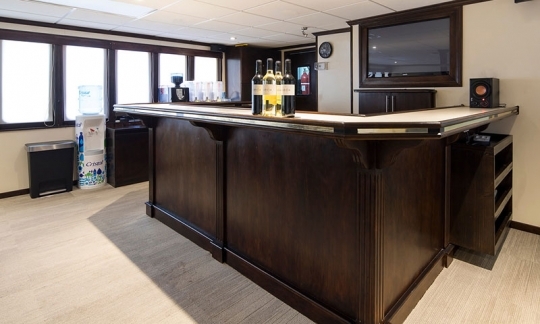 Whole boat charter equivalent to pay for 18 guests and 4 additional persons can join the cruise in a Deluxe cabin free of charge (total 22 guests). 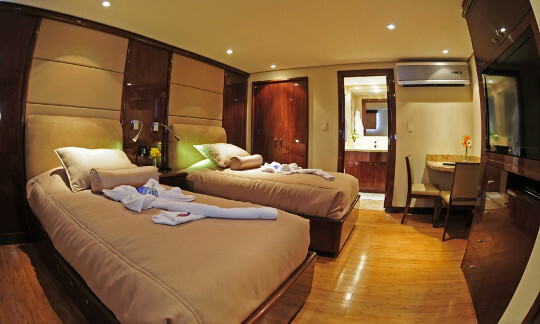 Whole boat charter rate (per night): US$ 9,390. Okeanos Aggressor II has a total of 11 staterooms, all with private en-suite bathrooms: 8 Deluxe staterooms, 1 Master stateroom and 2 Owner's suites. 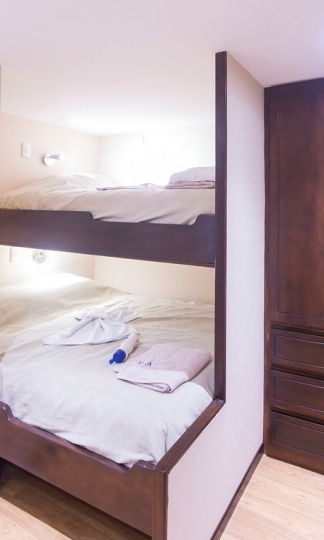 There are 8 Deluxe staterooms with bunks which have a lower double bed and single upper bed, all on the lower deck. The Master stateroom on the main deck has a queen bed and is equipped with a TV/ VCR, as well as a porthole. The 2 suites are situated on the upper deck. They each have sea view windows, a 42" flat screen monitor and DVD player, refrigerator, separate shower cubicle, table and chairs; one suite has a king bed, the other has twin beds. Meals are enjoyed in the saloon/dining area. Lunch is served buffet-style and dinner features table-side service. The menu includes a mix of international cuisine and local specialties with a Costa Rican flavour. 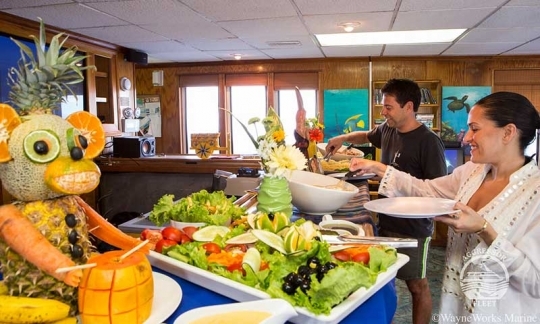 In addition to meals, mid-morning and mid-afternoon snacks are served to ensure you are well-fed between meals and dives. 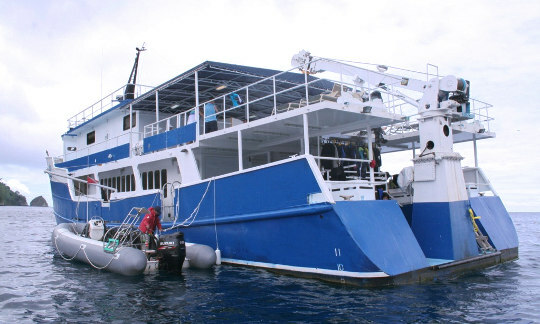 All drinks including alcohol are included in the liveaboard cruise price. International and local Costa Rican cuisine is served. Air-conditioned dining in saloon with both buffet and table served meals. Meals consist of breakfast, lunch and dinner with cookies and snacks in-between. Coffee, tea, drinking water, soft drinks, spirits, beer and wine are provided free of charge. All dietary requirements, including Halal and vegetarian, can be catered for - please send advanced notice. Catering begins with lunch on your first day after check-in. Breakfast samples: eggs to order, cereals, bacon/sausage, sliced cheese, croissants/toast, fresh fruit, yoghurt, apple strudel, fruit juice, tea & coffee. Lunch/dinner samples: pork with apple sauce, sea bass, tortillas, pasta, pizza, burgers, final night barbeque.